Test functionality of electrochemical CO sensing cell. Connect to digital input sensor ports. To connect to the digital inputs use a 22 AWG 2-wire cable. Connect the other end to the sensor screw terminal. LED indicators for operation status and system test. Compatible with the E-DI2-1W Digital Input Expander. Detects methane at concentrations in excess of 0.5%. 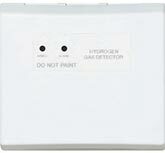 Detects propane/iso-butane at concentrations in excess of 0.3%. Detects methane at concentrations in excess of 0.8%. Detects propane/iso-butane at concentrations in excess of 0.5%. Audible alarm signal: 94 dB at 1 foot. Relay specifications: level selectable, normally open or normally closed, 250V AC, max 5A. Use to detect leaks of hydrogen gas in battery monitoring/charging rooms, substations, uninterruptible power supplies (UPS), and hydrogen fueled back-up power systems. Alarm set point: 10% LEL hydrogen gas. SPDT Alarm and normally-closed output relay. Sensor requires no maintenance or recalibration. Voltage supply: 12 to 24 VDC or VAC. Operating temperature: 32 to 120°F (0 to 49°C). Dimensions WxDxH (in): 4.5x5x1.63 (114x127x41 mm).